This free, short book is appearing in many places (someone has even set up a Reddit stream). 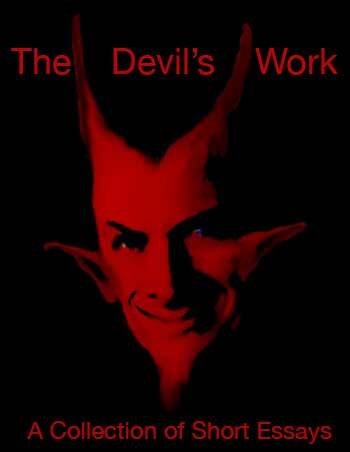 The Devil’s Work is a brutal assessment of man’s situation – don’t read it if you are squeemish. A taster has been extracted so you can see what you are getting into. It can be downloaded by clicking on the image – enjoy! If you listen carefully you can sometimes hear God’s laughter. It’s a faint ‘ho ho ho’ echoing around the universe. He just cannot believe his luck; a species of sentient beings, situated in the direst of circumstances, that pretends it’s having a good time. I am of course speaking of Homo Sapiens and our endless capacity for fooling ourselves. Here is a secret. If you dare look reality straight in the face you too will be able to join God, and laugh at the cosmic joke. You will become happy – not that happiness is a goal worth pursuing in its own right. Denial is the source of nearly all misery. While our imagination desperately conjures up happy ever after stories, life ruthlessly rips them down. If you do the ripping down yourself, you will derive pleasure from a sense of your own inner honesty and power. This series of short essays will do some of the ripping down for you, but the main task is yours. Read Ligotti, Ernest Becker, Schopehauer, Emil Cioran and others if you develop a taste for the destruction of your most dearly held beliefs. And remember – the most powerful person on Earth is the one who has nothing to lose.